Antique silver-plated crescents create the dazzling effect of this jewelry set. 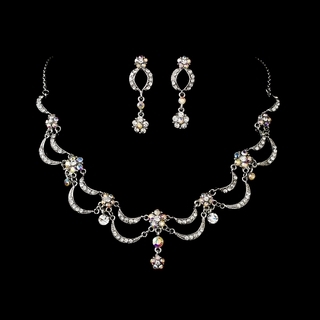 AB-Reflective rhinestones are arranged in a floral swag design, making this set a lovely choice for any season! Size: The necklace measures 17-1/2" long with a 3-1/8" extender, while the central floral drop measures 5/8" long. The matching earrings measure 1-1/2" long.